Climate change is expected to affect forest landscape dynamics in many ways, but it is possible that the most important direct impact of climate change will be drought stress. We combined data from weather stations and forest inventory plots (FIA) across the upper Great Lakes region (USA) to study the relationship between measures of drought stress and mortality for four drought sensitivity species groups using a weight-of-evidence approach. For all groups, the model that predicted mortality as a function of mean drought length had the greatest plausibility. Model tests confirmed that the models for all groups except the most drought tolerant had predictive value. We assumed that no relationship exists between drought and mortality for the drought-tolerant group. 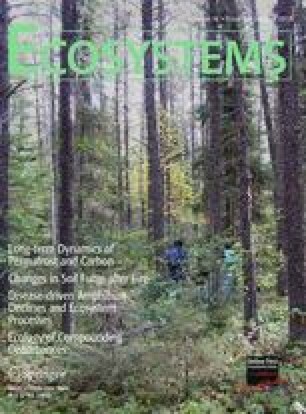 We used these empirical models to develop a drought extension for the forest landscape disturbance and succession model LANDIS-II, and applied the model in Oconto county, Wisconsin (USA) to assess the influence of drought on forest dynamics relative to other factors such as stand-replacing disturbance and site characteristics. The simulations showed that drought stress does affect species composition and total biomass, but effects on age classes, spatial pattern, and productivity were insignificant. We conclude that (for the upper Midwest) (1) a drought-induced tree mortality signal can be detected using FIA data, (2) tree species respond primarily to the length of drought events rather than their severity, (3) the differences in drought tolerance of tree species can be quantified, (4) future increases in drought can potentially change forest composition, and (5) drought is a potentially important factor to include in forest dynamics simulations because it affects forest composition and carbon storage. Gustafson conceived and designed the study, performed the research, analyzed the data, developed the methods, and wrote the paper. Sturtevant helped design the study, helped with interpretation of the results, and helped refine the methods. The online version of this article (doi: 10.1007/s10021-012-9596-1) contains supplementary material, which is available to authorized users. We thank John Stanovick for his considerable assistance with designing and implementing the statistical analyses. We thank Brian Miranda for programing the drought extension and Rob Scheller and Jimm Domingo for LANDIS-II technical support. Thanks to Scott Pugh, Mark Hansen, and Greg Liknes for assistance with the FIA database. Thanks to Chris Woodall for assistance with relative density calculations. Thanks to Mark Theisen of the Chequamegon-Nicolet National Forest for sharing his knowledge of tree biology. Thanks to Tina Baumann, Sue Lietz, and Richard McCullough for GIS technical support. We also thank Rob Scheller, Scott Pugh, and two anonymous reviewers for critical reviews that helped us greatly improve the manuscript.